Aggregate of white laminar Calcite crystals with fine polycrystalline surfaces. 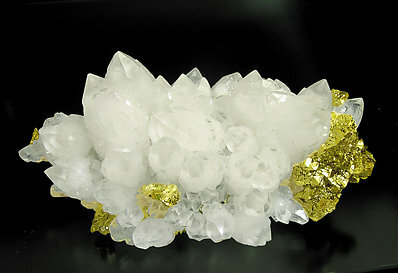 They are on matrix, with twinned Chalcopyrite crystals and small Quartz crystals. 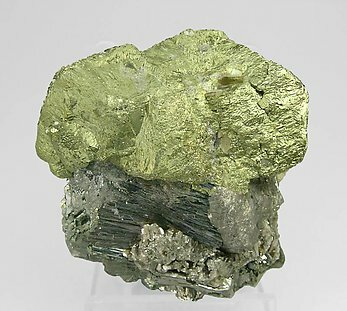 The sample, a classic from the Boldut mine, Romania, is from a single find in the year 1999. The specimen is a miniature but the main crystal is of a considerable size. It has an extraordinary sharpness of its faces and edges. Also extraordinary are its luster and the presence, on the back, of growths looking like sawteeth. 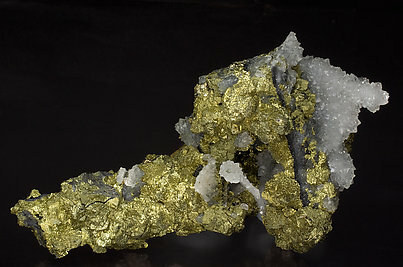 Chalcopyrite with Quartz. Sharp crystal. A novelty at Tucson 2019. 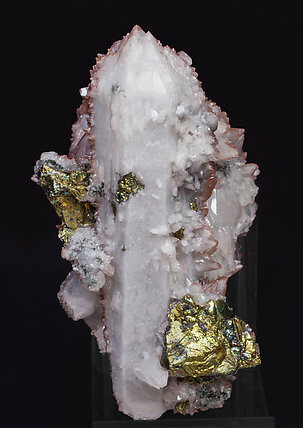 Bright Chalcopyrite crystals with very well defined parallel growths partially coated by small epigenetic Galena crystals and implanted on a group of white, doubly terminated Quartz crystals with very acute and well defined scalenohedral Calcite crystals. 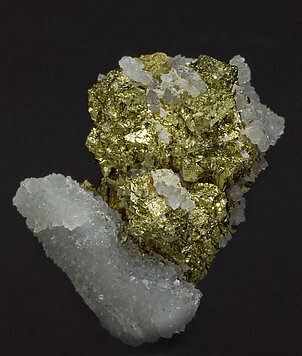 Group of Chalcopyrite crystals that show the dominant forms of a ditetragonal scalenohedron. 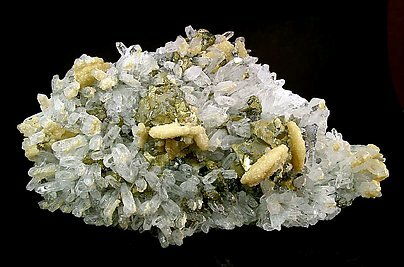 They are coated by small, very bright Arsenopyrite crystals, Muscovite aggregates, platy Siderite crystals that fully cover the back side and a doubly terminated Fluorapatite crystal. The upper levels of Panasqueira are currently offering surprising and pleasant novelties, with samples that are very different from what has been known from this mine. 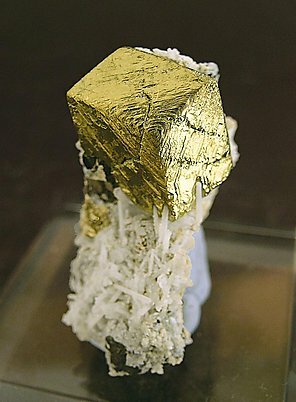 Parallel growth of two large crystals of Chalcopyrite with excellent luster (for the locality) whose matrix is a group of prismatic crystals of Arsenopyrite, some of them doubly terminated, and with lenticular crystals of Siderite and leafy aggregates of Muscovite. 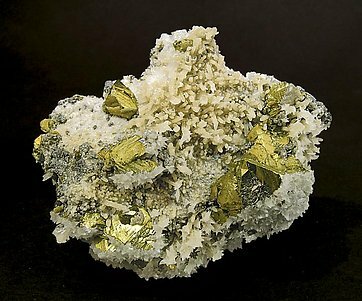 Aggregate of twinned Chalcopyrite crystals with the dominant forms of a disphenoid. 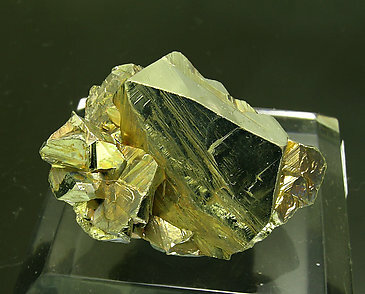 They are very well defined and bright and have cubic Pyrite crystals on the back; small Galena crystals are associated. 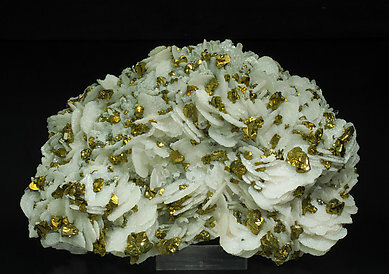 The chalcopyrite crystals are partially coated by groups of lenticular Calcite crystals. 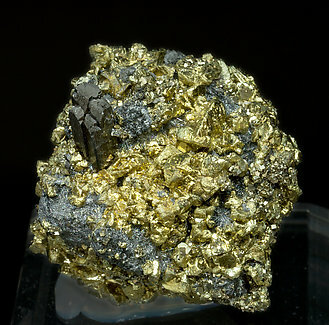 A classic piece from Cavnic, where good Chalcopyrite specimens are very scarce. 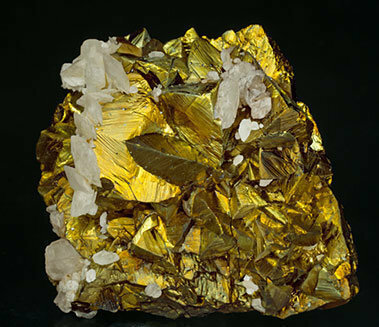 Aggregate of disphenoidal Chalcopyrite crystals with pseudotetrahedral shape, with very well defined faces and edges and showing a very intense luster. They are on matrix with growths of white lenticular Calcite crystals. The sample has a great quality for the locality, where good Chalcopyrite crystals are uncommon. 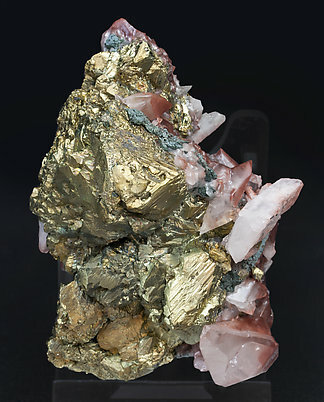 The complex growth forms of the Chalcopyrite are on a matrix of compact Quartz crystals. During a later phase of crystallization, with a surprising esthetic effect, some curious lenticular crystals of Calcite grew on the matrix. 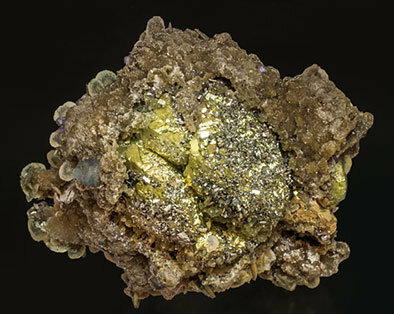 From a historic locality where mining activities have ceased, the twinned and brilliant crystals of Chalcopyrite are perfect examples of the species. Two generations of Quartz, which differ in color, partially cover both the Chalcopyrite and the matrix. 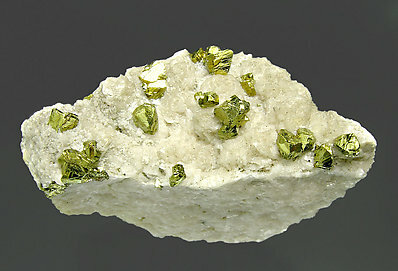 Very isolated crystals of very well defined faces and edges and extraordinarily bright, on a matrix of Dolomite. We specially note the locality because, actually, it is very difficult to obtain specimens of such quality from there. Spheroidal, almost a floater, aggregate of twinned Chalcopyrite crystals with parallel growths of Ferberite crystals and small mossy Boulangerite (variety plumosite) aggregates. A novelty at Tucson 2019. 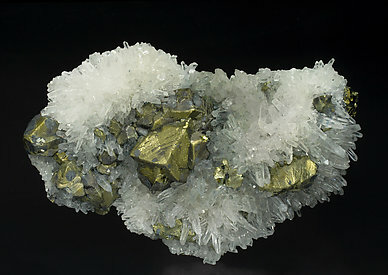 Group of bright Chalcopyrite crystals with very well defined parallel growths partially coated by small epigenetic Galena crystals and implanted on a group of white, doubly terminated Quartz crystals. 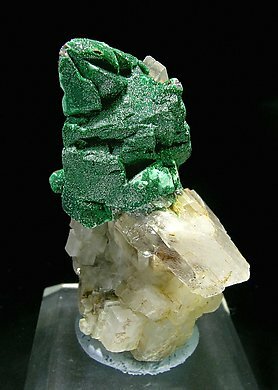 Group of crystals of Chalcopyrite of tetrahedral habit, one of them clearly dominant, pseudomorphed by crystalline Malachite, contrasting with the matrix of Dolomite rhombohedra. 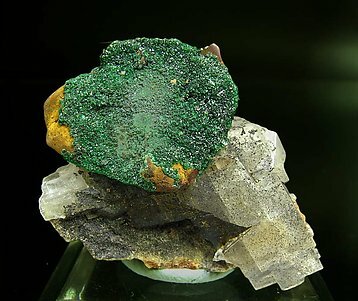 Not so well known as the more famous Dolomite, Eugui Malachite is sporadically found, completely coating sharp crystals of Chalcopyrite. 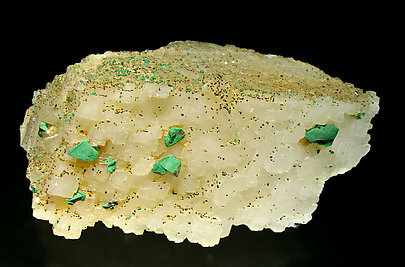 Chalcopyrite crystals of very well defined faces and edges, pseudomorphed by Malachite, on a rhombohedral crystal of Dolomite whose faces have overgrowths with slight curvatures. Unusual. 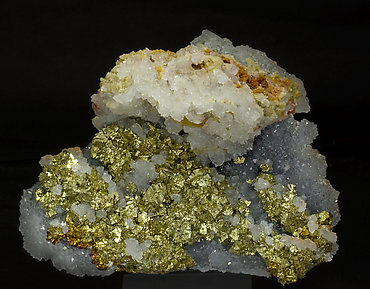 Group of Chalcopyrite crystals on matrix. They are very bright, with fine striations on their faces and they are coated by Arsenopyrite micro-crystals and lenticular Siderite crystals. 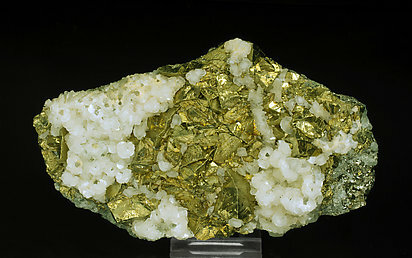 Twinned crystals of Chalcopyrite with single forms and very well defined faces and edges. They are bright and are on a matrix of Quartz crystals. The quality is excellent for the locality. Crystals have very defined faces and edges and form very distinct interpenetrating twins. 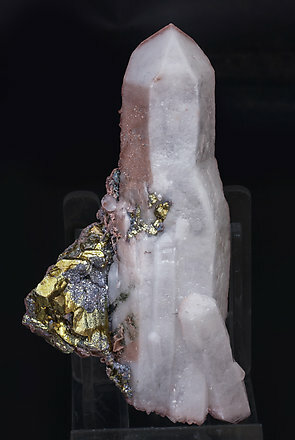 The sample is very esthetic due, especially, to the contrast between Chalcopyrite and the Quartz crystals with it. A novelty at St. Marie 2012. 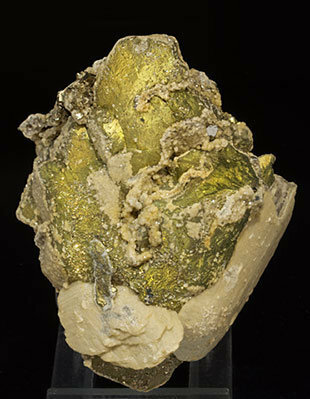 Very aerial aggregate, very rich in short disphenoidal crystals of Chalcopyrite with a false appearance of the tetrahedron. They have very well defined faces and edges, are extraordinarily bright and some of them are very individualized. They are on a matrix of Quartz crystals. A novelty at St. Marie 2012. 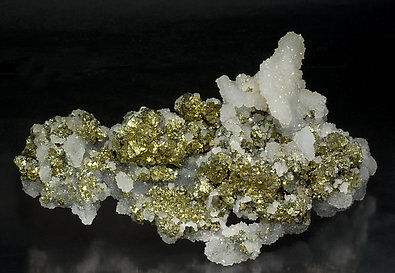 Drusy growth, on matrix, of short disphenoidal crystals of Chalcopyrite. They have a second phase of crystallization, of granular aspect, that coats the faces of the first crystalline growth. They are with comb-shaped growths of Quartz crystals. A novelty at St. Marie 2012. Irregular aggregates of short disphenoidal crystals of Chalcopyrite with a false appearance of the tetrahedron. They have very well defined faces and edges, are extraordinarily bright, partially iridescent in some areas on the sample, and some of them are very individualized. They are on matrix, with Quartz crystals. A novelty at St. Marie 2012. Drusy growth, on matrix, of short disphenoidal crystals of Chalcopyrite, They have a second phase of crystallization, of granular aspect, that coats the faces of the first crystalline growth. They are with comb-shaped growths of Quartz crystals. What color! 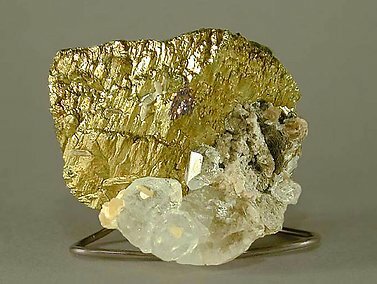 An amazing yellow, this crystal of Chalcopyrite also has great form and is well positioned on the matrix of Quartz and some Sphalerite.